Today, it’s Wild Orchid by Estee Lauder. For my eyes, it’s always a faint stroke of a brush with a shimmering powder and a small smoky portion of black eyeliner. And the rosacea on my cheeks takes care of the blush all on its own. It’s a game my friends play to make my emotions come to the shallow part of my face, burning with a bright red. But I always go for the evil queen look when it comes to lipstick. The dark purples. The deep reds. The Wild Orchid might be a little too pink for me. It makes me look less like a dramatic queen of crazy eights (because I’m certainly no queen of hearts) and more like a harmless, innocent princess. All la-dee-dah and daydreams. I look like a child. I look in the mirror in the warmly lit make up shop hidden in the shadowy outlet mall in Orlando, Florida. My Aunt and I are dropping my cousin off in the happiest place on Earth, so she may begin her college study program as a character performer in the park. It’s been raining all day, and my aunt and I are passing the time by browsing together. 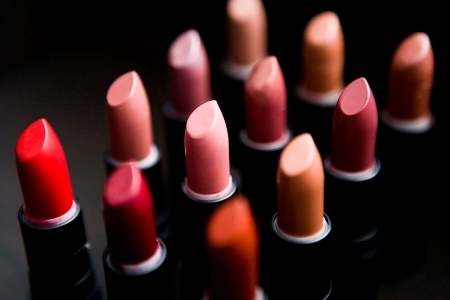 We paint our lips, then blot them on our small, white tissues. I admire a while the pattern of colorful kisses in crooked patterns across the tissue paper. There is something so satisfying about leaving behind trails of your lips on places. Like the tips of straws and the white lids of cardboard coffee cups. “See anything you like?” My aunt asks. She inspects closely, looking for her own shade in the shiny golden tubes. I tell her the name of the Wild Orchid lipstick that happens to be growing on me in the moment. “How much fun would it be to be the person to come up with the names of things like that anyway?” she smiles, and pauses a moment while she studies the new color on my face. She then turns and makes her few purchases at the counter, while I continue to look through the products on the shelves. My aunt holds a few small gift bags in her hands, as we walk through the doors of the shop together. “I can just feel my hair getting bigger by the minute,” she says to me. I pin mine in a loose, frizzy bun at the crook of my neck. And I smile, glad to be in the company of my Texan aunt in Florida for a while. The rain has let up a while, but the wetness hangs in the air enough to make our hair stick up. That night, on the fluffy white comforter on the queen sized bed in the room my aunt and I share is a dark blue Estee Lauder box. I unfold the box with the flick of my thumbnail and inside is a shiny, gold tube of lipstick. Wild Orchid, it reads. “You didn’t have to do that,” I say to my aunt with a shy, unbelieving smile. I’ve been looking at her that way since I can remember. Looking at her like a child. Like how a princess must addresses the queen, polite and deeply honored. We continue the evening ritual we had created that week. A few moments of lulling conversation about God and futures, and then a marathon of Friends on TBS to fall asleep to. So we say goodnight, and let Ross and Rachel speak to us for a while. In the back of the baby book I find a small card, a similar shade of the wild orchid pink. It comes in the book after a lock of hair, and before my greasy black footprints. It’s a birth announcement tied with a small white bow at the top. It reads my name, my weight and my length. At the bottom it reads The proud Aunt, Sharon Shannon. I run my hand over the card. She always told me she thought I was hers when I was first born, I think. I will nod to the fact that I am certainly my mother’s daughter in nearly every aspect; but the Wild Orchid makes me a little bit my aunt’s daughter, too. Ladies, have you ever felt like something small about yourself–like the color of your lipstick–was a bigger representation of yourself than you realized? What was it? How did you discover it? Sarah! No tears! :) It's funny, whenever I'd go through a big change in my life, my hair would be the firs thing to get chopped off. What is this lady-phenomenon?